The tile floor in this master bathroom resembles artwork. Perhaps it’s not typical to notice the floors when you first walk into a room. 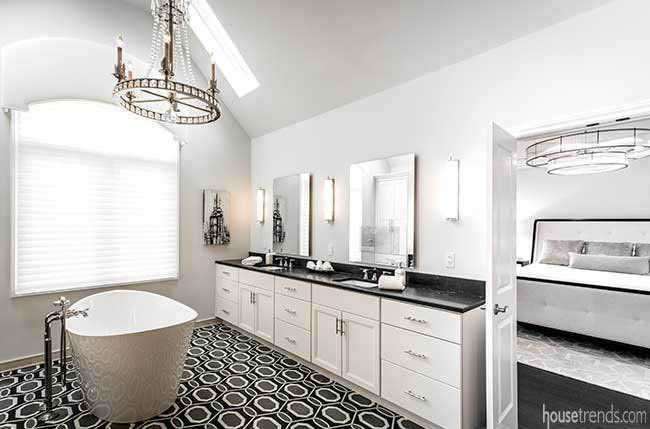 But in this Hampton master bathroom, your eyes immediately are drawn to the exotic, bold tile floor. The natural stone with its Capri Waterjet design is akin to a piece of art, and it provides a framework for every other design choice in this grand bathroom. The homeowner and his wife wanted a fresh look for their en suite bathroom, one that was modern and chic, with distinct his and hers domains. 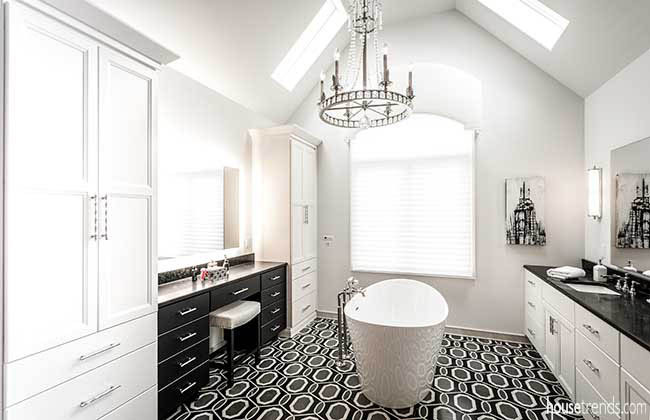 The master bathroom was completely gutted and was part of a larger home renovation. “We built our home 15 years ago; we felt it was time to update it with a new, fresh look,” says the homeowner. 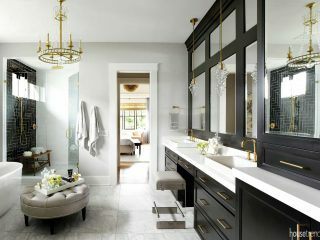 The homeowner and his wife gave free rein to interior designer Susan Muschweck and Splash to design a bathroom that is nothing short of a showstopper. Muschweck says the former bathroom – while large in square footage – looked smaller than it was because of the choppy way it was designed. “The goal was to make it much more modern and efficient with all of the options that are available with plumbing and lighting. 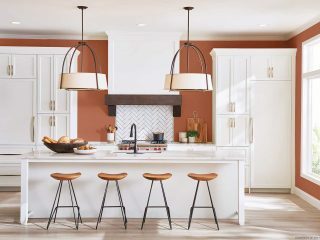 This was a very high-end project, so we were shooting for high-end materials and a very timeless design in a fairly new home,” she says. The designer utilized the existing footprint but had to shift things around, such as removing a closet here and moving a door there, in order to attain the open feel. “The focal point is visually clear – the fabulous floor – and everything else around it is extremely elegant and rather quiet with a nod to some of the tones in the floor,” Muschweck says. 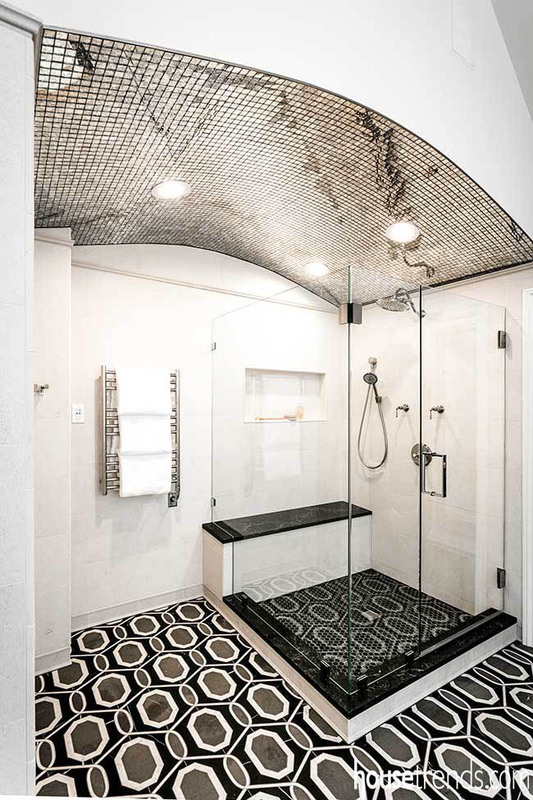 “I wanted to do a statement floor, therefore I wanted to keep everything around it simple, so we ended up with creamy tile in the shower, accented in black,” confirms Maria Fairbanks, kitchen and bathroom designer with Splash. The former shower had a large hollow bulkhead, which was removed and replaced with a barrel vault, which Muschweck says was a unique piece of architecture that was not easy to achieve. “A lot of carpentry work goes into it prior to laying one piece of tile,” she adds. The elegant floors are reflected in the antique mirrored tile embedded in the barrel-vaulted ceiling, which serves to open up the space and provides a wow factor. In addition to the shower, another bathing option is the soaking tub, which occupies a prominent place in the center of the room. Though Muschweck removes soaking tubs more frequently than installs them to preserve precious square footage, in this case, she added a small soaking tub at the homeowner’s wife’s request. The small tub, with its elegant Roman faucets, is strategically positioned to face the vanity mirror, inside of which a small television is hidden for a relaxing bathing experience. 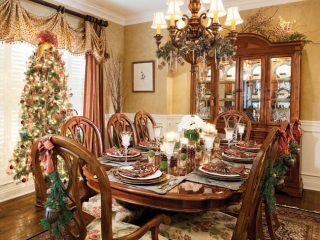 Splash of Cranberry Township provided the cabinetry, countertops, floors and fixtures. The high-end maple cabinetry was semi-custom, with a beautiful dark quartz surface that mimics a black marble. 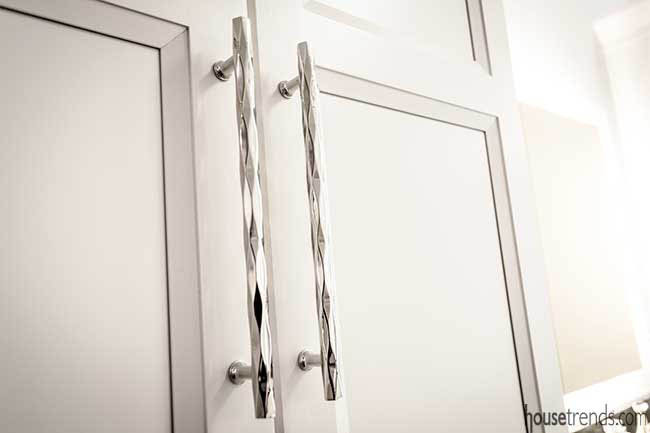 The bathroom has modern bar pulls with a classic twist, faceted with an almost quilted look and polished nickel finish. 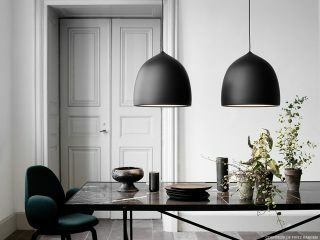 The fixtures have a simple elegance so as not to detract from the floors, which are the focal point of the space, says Fairbanks. The homeowner’s wife now has a softly lit vanity area of her own in which to apply makeup. The vanity is painted solid wood in gardenia and black and has multiple drawers. Two large cabinets, providing ample storage, flank the vanity. In fact, there are hidden electrical outlets inside the drawers as well as interior cubbies and compartments for virtually every bathroom accouterment, to ensure that the countertops remain free of clutter. The lighting choices in the bathroom were purposeful. “A well-thought-out lighting plan is integral to any room, particularly in bathrooms,” says Muschweck. “You’re doing a lot of close-up work in a bathroom, so you need to see the very best you can.” She added that having layers of lighting also is important in a bathroom so that shadows aren’t cast. To that end, Muschweck affixed an ornate chandelier, one that speaks to the luxurious surroundings, in conjunction with recessed lighting, along with individual sconces on either side of the mirrors. Though a chandelier is not typical in a bathroom, Muschweck thought that it would provide some visual interest, acting as a piece of art. Plus, the vaulted ceiling with an open skylight is a source of natural light, as is the window, in which a custom cornice was added to give it dimension and texture. Beneath the cornice is a motorized blind for privacy. All of the lighting fixtures are on dimmers so they can be adjusted to the homeowners’ preferences. The homeowners love all the bells and whistles of the luxurious new space. “It is all pretty spectacular. 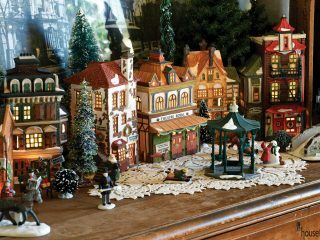 Everything is a piece of art,” he says.